Barrie Bart. Oil on board, 16 by 20 inches. Barrie Bart was born and educated in Paris. During World War I, Bart as a pilot with the French airforce, commanding the largest aviation school in France, he was one of France’s first aces, with seventeen German planes to his credit. At the end of the war Bart was appointed Official Painter of Military Aviation by Premier Clemenceau. Immigrating to the United States, Bart had a summer home in South Kent, Connecticut, and a winter studio in Melbourne, Florida. 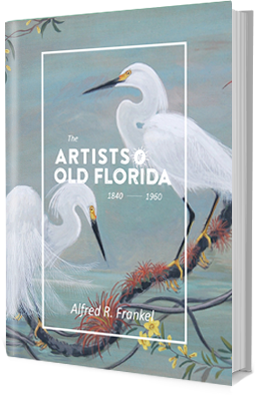 In 1955 Bart was a judge at the St. Augustine Art Association, February exhibition. That year Bart, working as an architect in Melbourne, drew up plans for an eight building campus, in the heart of the city, for the University of Melbourne (Florida). In 1961 Brevard Engineering College purchased the property of the University that became the Florida Institute of Technology. Education: Le College Chaptal, Paris; L’Universite de Grenoble; L’Ecole des Arts Decoratifs; L’Ecole des Beaux Arts, Paris; in Milan, Florence, Rome.